Catherine Delaney King, 92, passed away peacefully in Lancaster, Pa on Friday, March 23, 2018, with her granddaughter Natalie by her side. She was born on June 20, 1925 in Philadelphia to Richard Anthony Delaney and Florence Sparks Delaney, their first child. She grew up in and always loved Philadelphia. She graduated from West Catholic Girls High School in 1943. She moved to Wayne with her family and raised her children in King of Prussia. She was the loving wife of Charles C. King who passed away in 1997. She is survived by a sister, Elizabeth McCann, a daughter, Stephanie Miller (Joseph), son Kevin, three grandchildren Natalie (Brian), Brendan (Maria) and Lauren (Eric), two great granddaughters Coraline and Mackenna and her loving cat Ambrose. Family and friends are invited to a Memorial Service and celebration of her life on Saturday, April 21, 2018 at DeBord Snyder Funeral Home, 141 East Orange St., Lancaster, PA, 17602 at 2pm. There will be family visitation at 1:30pm until the time of service. After the memorial, everyone is welcome to the home of Stephanie and Joseph Miller for food and fellowship. Donations in her name may be made to Hospice and Community Care (www.hospiceandcommunitycare.org). Rest in Peace gentle lady. 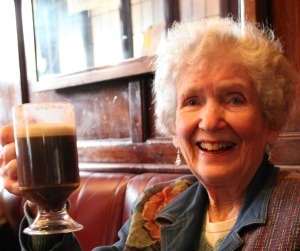 I always enjoyed your company and lots of tea and all things Irish. Sincerest sympathy to all family and friwnds who are missing her. May your gentle soul rest in peace. I wish to convey our sympathy to the family and friends. Thinking of you all at this Sad time. My sincere condolences for the loss of your wonderful Mom/Grandmom/Friend. The sadness you feel is shared by all those that love and cared for your Mom. My sincere condolences to the family of dear Catherine. She was such a gentle spirit with an Irish wit! I know she will be dearly missed by everyone who knew her, including me. I loved sipping tea with her and chatting……. or sipping Irish whiskey……or a gin & tonic! May your wonderful memories help you through this difficult time. Fifty years ago it all began with a donut in Avalon, NJ. I am proud to say as of 2 weeks ago, I was still a “brat”. We are all blessed to have been part of Aunt Catherine and Uncle Charlie’s lives. Everyone has a favorite memory or funny story to tell. There is one memory , though, we all share . Aunt Catherine and Uncle Charlie are the thread that brought us together. They made us “one family” and one family we will always be. Love always and Rest in Peace. So sad to hear of the loss of your mom. She’ll live on in my memory as the fun-loving mother of my friend who loved to laugh and took me for my first ride in a convetible. Rest In Peace, Aunt Cass. We’re going to miss her. She and Uncle Charlie were so good to me at a very difficult time in my life. I’ll always remember her taking me shopping in Philly and I do cherish the memories of when we were together. Praying for the family. Love you all.